Montevina CPU in the New iMac or Not? PA Semi: A Return to Vertical Integration? "Even as Apple and Microsoft expand into new markets, the computer business remains a big financial driver for both companies. Illustrating that point, Apple reported a 51 percent increase in Mac shipments yesterday, contributing to a big increase in profits. And some analysts suspect that better-than-expected PC shipments may have boosted Microsoft's latest quarterly results, which are set for release this afternoon. "So it's a good time to revisit the trends in PC and Mac shipments.... The numbers show the Mac experiencing significant growth in recent quarters. In comparing that to PC growth, the effect is magnified because the Mac is growing from a smaller base, a sliver of the overall personal-computer market. But it's still an interesting trend to observe." "'Vampire power' has been bugging me ever since I first heard of it. "It's the juice consumed by electronic gadgets even when they're turned off (also called phantom loads, standby power or leaking electricity). They just sit there, plugged in, sucking electricity, at a cost to you and to the environment. According to the Energy Department, vampire gadgets account for about 25 percent of total residential electricity consumption in the U.S. 25 percent of the power used by home electronics is consumed while they are turned off. "The APC strip detects when your Mac or PC goes to *sleep* (standby mode), too. It actually measures the amount of current being drawn by the master outlet. When it drops below 15 watts, the strip realizes that your computer has gone to sleep, and it cuts power to those slave outlets. It works perfectly on my Mac and my PC." Link: APC Power-saving Essential SurgeArrest 7, currently $39.99 shipped from Amazon.com, $23.58 plus shipping from PC Connection. "Back on the iMac G5, each of the three USB ports could supply 500mA - plenty for any bus-powered device, and enough to allow the connection of an unpowered hub with multiple devices that only require the normal 100mA or less. "Fast forward to the 'April 2008' iMacs, and things have changed. There are still three USB ports, but only one of them can be used as a high-power port at any given time (source: iMac Developer Note, Apple)." Link: Apple's USB Power Famine - What's Happening with USB Power on the iMac? "Apple is often lauded for its design chops. And Apple's post-modern industrial design is lyrical next to Dell's neo-Soviet brutalism. But Apple makes some really stupid choices. Here are the top 5 - and the best workarounds. "And the #1, all-time, biggest Mac design fiasco: the Mouse"
"Following the announcement of the new iMacs, and their rather surprising specification, the websites are speculating on what is really inside of those new iMacs. While some websites seems to have mixed up platform code name with CPU generation, the hardware sitting in the new iMac is for sure exotic. "According to several websites, CPUs are a 'special' model of the current 45-nm Penryn processor, but not officially available from Intel catalog.... So, either it is indeed 1066 MHz FSB capable CPU on a 800 MHz Santa Rosa FSB, or the new iMacs feature a overclocked version of the Santa Rosa to bring support for 1066 MHz FSB." Link: New iMac: Montevina or Not Montevina? "Following [the new] iMac introduction, speculation has been rampant as to whether Apple got an early shot at Intel's upcoming Core 2 Duo Extreme X9100 chip. The X9100 is meant to usher in the 'Montevina' Centrino 2 era, and boasts significant less power consumption than its forebears, in addition to those spiffy new clock speeds. Well, it turns out the new iMacs aren't Montevina...."
"...an Intel spokesperson told BetaNews, the new 3.06 GHz option - which customers may request in place of the standard 2.83 GHz processor - is a 45 nm Penryn-class Core 2 Duo CPU. It is not, therefore, the yet-to-be-released X9100, which will be a Core 2 Extreme at 3.06 GHz that supports the 1066 MHz front-side bus...."
"Look what arrived on our doorstep today! That's right - the shiny, expensive new iMac that's now equipped with that funky custom and/or overclocked 3.06GHz CPU. Take a look at us wildly unboxing and handling the behemoth in the gallery below, and get a load of its fairly impressive Xbench scores...."
"We've written a lot about Psystar's Open Computer Mac clone. I'd venture so far as to say we've written about it way too freakin' much. "But I figure it scores pretty high on the 'potentially interesting' meter, so it's worth mentioning that the Open Computer may actually be a real, booting-and-computing machine that Pystar is actually selling and actually shipping." "Okay, so we've been playing with the Psystar Open Computer for a few hours now, and we've formed some early impressions and put together a short video of it in action. We haven't really tried to stress the system yet, but based on our other experiences with OSx86 machines, we're expecting things to generally go smoothly. That said, there are some definite rough patches and issues, all mostly having to do with the fact that OS X isn't really built for this hardware. Here's what we know so far...."
"The Open Computer has landed at CNET Networks. "And now that the lingering doubts appear to have been satisfied, we can start to focus on the real question: What sort of legal issues is Psystar going to encounter down the road, and how exactly is Apple going to handle that?" "Apple this week bought a fabless chip company called PA Semiconductor and pundits far and wide are trying to explain the deal with broadly varying ideas, some of which are close but none seem to really understand what the deal is about. In the short term this acquisition means precisely nothing to Apple users. In the long term it could be quite significant, however, and gives a number of tantalizing hints about Apple's hardware strategy. "Why would Apple, having already jumped from PowerPC to Intel, spend $278 million to buy a company that is best known for designing PowerPC chips? Are they preparing to dump Intel? No. Does it have anything to do with Intel? Yes." "This week, Apple shocked the semiconductor industry by acquiring P.A. Semi, a 150-person chip design company, as first reported by my colleagues at Forbes.com. "Opinions differ on why Steve Jobs chose to take this additional risk of vertical integration when every chip vendor on the planet is falling all over itself to sell its wares to Apple. "My belief: The computer industry is heading back toward vertical integration." "I'm an Apple user. Long time, pure bred, never owned anything else. Oh sure, I've used Windows machines, but it's never crossed my mind to use one daily. "I mean, Windows? Like most Apple users, the very idea makes me vaguely anxious. When you're an Apple user, you're a snob. You feel - no, you know - that your OS is superior. The machines are fast and secure, and they're gorgeous, too. "In short, my expectations for Ubuntu were modest. In fact, they were pretty low. "...It turns out the command line is completely optional. If you don't want to mess with it, Ubuntu lets you use point and click for everything. Major relief." PR: QuickerTek Inc. has applied its proven technology to the new Apple Time Capsule. The Extreme Dualy is designed for both the 500GB and 1TB models of the Time Capsule wireless backup devices, and extends the wireless range up to five fimes the stock range. This increased range is also significant for those users who need to push wireless through walls, floors and other common wireless signal obstacles. 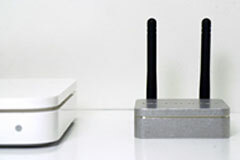 Increased RF wireless power is important because each common wall and/or floor between the computer and the Time Capsule reduces wireless signal strength by 25%. The increased wireless performance of the Dualy Extreme comes from twin 500 milliWatt Transceivers (or 1 Watt Transceivers) coupled to two antennas that create two combined signals paths for up to five times more wireless range. Two options are available: one featuring 500 milliWatt of RF power (two 500 mW Transceivers) and another option with 1 Watt of RF power (two 1 Watt Transceivers). QuickerTek can install the Dualy Extreme on the customer's 500GB or 1TB Time Capsule for those customers who don't want to perform the upgrade themselves. Dualy Extreme is ideal for wireless networks at work, home, school, hotels, coffee shops - anywhere signal strength and speed are hampered by distance and common office and home wireless obstacles. 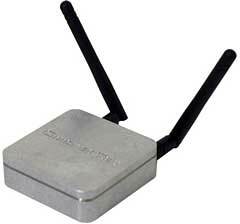 The upgraded Time Capsule operates at the full 2.4GHz range using the multiple antenna, high-spped MIMO capability. Two 500 milliWatt or 1 Watt Transceivers inside Dualy Extreme reach out to computers capable of any of the most common forms of 802.11 wireless networking hardware including 'b', 'g' and 'n', manufactured by a wide variety of vendors. Each Transceiver has a 3dBi antenna to provide the speed necessary for high speed 802.11n wireless that runs in the higher 2.4GHz wireless range. Dualy Extreme may be upgraded with even more powerful antennas for even greater distance and wireless speeds. A more powerful also provides additional wireless power to penetrate walls and floors that reduce wireless effectiveness. Antennas are attached via 2-foot cables to get the antennas up and away from desktop wireless impediments. Like most QuickerTek products, the Dualy Extreme is backed with a one-year warranty on parts and labor. PR: Razer, specialist in high-end precision gaming and lifestyle electronics peripherals, has launched the Lunar White Razer DeathAdder, an ergonomic right-handed gaming mouse specifically built with the needs of Mac OS X gamers in mind. The first gaming mouse in Razer's arsenal specifically developed for the Mac gamer, the Razer DeathAdder's renowned Razer 3G Infrared Sensor technology and engineering improvements make it ideal for Mac OS X gamers in need of a fully feature gaming mouse. The DeathAdder for Mac OS X features the 1800 DPI (dot per inch) Razer Precision 3G infrared sensor with 1000Hz Ultrapolling/1ms response and a tracking speed of up to 120 inches per second (IPS). All these features of the Razer DeathAdder for the Mac OS X further empower gamers with unprecedented levels of accuracy, precision, and tracking speed for First Person Shooter gamers (that play classical Mac OS X games like Unreal Tournament, Halo, and Quake III Arena). The Razer DeathAdder has five independent Hyperesponse buttons and award winning On-the-Fly Sensitivity drivers that allows players to instantly change and adjust mouse sensitivity settings to their game environment. The Razer DeathAdder for Mac delivers high performance technology with easy to use multiple programmable features. As a bonus, the mouse possesses a sleek and smooth rubber coated matte black finish that enhances gripping traction while maintaining a dry surface, with a pulsating white Razer logo that illuminates its elegant curves and the perfect right-handed ergonomic shape. "We wanted to provide Mac gamers with a gaming mouse optimized for FPS genres. The Razer DeathAdder is one of the greatest gaming mice we have developed and we are pleased to offer Mac gamers with an alternative - a mouse known for its precision and speed," said Robert "Razerguy" Krakoff, president of Razer. Other World Computing (OWC) has announced new Memory Upgrade Kits of 1GB, 2GB and 4GB for Apple's new iMac Core 2 Duo 20" 2.4GHz, 2.66GHz, 24" 2.8GHz and 3.06GHz models, which were announced by Apple yesterday (April 28, 2008) and are just starting to ship. OWC Mac Memory is also available in modules and kits of up to 4GB for previous iMac models. All memory options are immediately available and shipping. Additional savings also available for customers who take advantage of OWC's trade-in program, which provides $10 cash back for the trade-in for each Apple 1GB module. OWC is an Apple Developer Connection Premiere member and OWC memory upgrades meet Apple's electrical and mechanical design requirements. OWC maintains an active state-of-the-art test lab to ensure the highest product quality and reliability. Its modules provide a lifetime of high-performance, reliable operation, backed with a Money Back Guarantee and OWC's Lifetime Advance Replacement Warranty. "OWC is all about maximizing performance and, impressively, we've found there can be better performance attained even between 2GB and 3GB memory configurations than getting a new system with a faster processor," said Larry O'Connor, President OWC. "More memory makes a tremendous difference, as our real-world testing illustrates. Installing the full 4GB of memory lets you truly reap the full benefits these systems have to offer." OWC is an expert in the Mac memory market, with nearly two decades of experience providing memory module upgrades for Mac computers. The company has conducted independent memory benchmarks on Apple's Intel Core 2 Duo iMac, MacBook, MacBook Pro, and Mac mini models, which show both how newer and older systems compare, as well as the incredible benefit that additional memory provides. Even upgrading a prior generation model to its maximum memory can provide higher real-world performance than the latest and fastest system with just a base memory level. PR: WiebeTech has released a new professional hard drive docking station which allows users to natively connect to bare 3.5" IDE/PATA and/or 2.5/3.5" SATA hard drives. WiebeTech DriveDocks are popular tools used by technicians, forensics analysts and PC enthusiasts. "UltraDock is our new flagship of docking products," said James Wiebe, VP of Research and Development at WiebeTech. 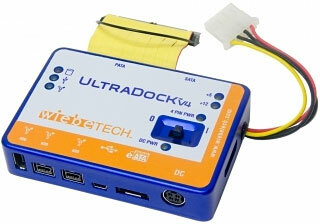 "It complements the rest of our line of docks by adding native support for SATA drives and IDE drives on the same dock. If you have a bare hard drive to read or recover, this dock is what you need to do it." A fourth generation dock from WiebeTech, UltraDock has seven status LEDs, two hard drive connectors, and five host ports, making it the most feature-rich and port-rich hard drive dock on the market. Recently, WiebeTech also launched USB DriveDock, a $49.95 dock with fewer features. "With these two new products, our family of docking products continues to grow," said James. "We now have six to choose from and I'm sure there is a dock to fit anyone's needs." All docks are in stock and ready to ship. For complete information and specifications on UltraDock click here. Resellers can purchase WiebeTech products from Synnex, D&H and Ingram Micro. End users may purchase from PCMall, MacMall, or PC Connection. Government customers are encouraged to purchase from Lyme Computer, CDW-G, or PCMallGov. All products are also available directly from WiebeTech. All docks are in stock and ready to ship. For complete information and specifications on UltraDock click here. UltraDock Features. Other World Computing (OWC), a leading Mac and PC technology company, today announced lower pricing on its award-winning Mercury Elite-AL Pro "Quad Interface" storage drive line of up to 1TB for the best value on the market. The Mercury Elite-AL Pro Quad Interface storage drive provides high-speed maximum performance with a wide selection of connectivity options for FireWire 800, FireWire 400, USB 2.0, and eSATA ports, for easy Plug 'N Play compatibility on virtually ANY computer system. Priced starting at $155.99, the Mercury Elite-AL Pro "Quad Interface" storage drive line features the fastest single drive transfer rates possible, exceeding an amazing 80 Megabytes per second via FireWire and up to 150MB per second via eSATA. Geared to those that want a convenient, compact single drive solution with a selection of interface options, the storage drive is ideal for audio, video, digital photography, professional music, and graphics applications. In addition, the Mercury Elite-AL Pro is also perfect for backup and is EMC® Retrospect® Backup Certified. The winner of numerous industry awards, the OWC Mercury Elite-AL Pro was most recently awarded Club Overclockers "Seal of Approval" as "A Superior Product of Ultra High Quality," April 2008. "The Mercury Elite-AL Pro looks and feels far superior to other external hard drives and hard drive enclosures we've seen before," said Club Overclocker Founder Scott Vanderford in his review. High Performance: employs the next-generation high-speed Oxford 924 chipset combined with the fastest drive mechanisms available for the fastest single drive transfer rates possible, exceeding an amazing 80 Megabytes per second via FireWire; up to 150MB per second via eSATA. High Reliability: a top-notch design and high-quality components ensure it's built to last. High Portability: designed for eSATA, FireWire 800, FireWire 400 and USB 2.0+1.1 for easy Plug 'N Play on virtually ANY system. Style: designed to compliment any user's system. A blue activity LED behind the front grille shows when your drive is being accessed. Created with the Power Macintosh G5 system in mind. Compact Shock Resistant Design.&#149; Warranty: includes two year warranty.&#149; Super Quiet Operation. The Mercury Elite-AL Pro Quad Interface storage drive line comes complete with utility and backup software, including IntechHard Disk SpeedTools Utilities for Mac OS 8.6-X, ProSoft Engineering Data Backup for Mac OS v10.2.8 or later and NovaStor NovaBACKUP for Windows 2000 or later. It also includes all the cables for FireWire 400, FireWire 800, USB2, and eSATA interfaces. The drive is compatible with all Apple® OS Versions 8.5 through 9.2.x; Apple OS X 10.0.3 and higher (including OS X "Leopard" 10.5.x), Microsoft® Windows® ME, 2000, XP, Vista; and any OS or device with FireWire®, USB, or eSATA. Mercury Elite-AL line also includes FireWire 400+USB Combo and the FireWire 800/400+USB2 "Triple" models. PR: Xirrus, Inc., the only Wi-Fi "Power-Play" that can replace Ethernet workgroup switches with Wi-Fi as the primary network connection, announced today the release of its popular Wi-Fi Monitor utility as a Yahoo! Widget for Apple Mac OS X. Widgets are simple, mini-applications that run on a user's computer desktop and provide quick access to useful information and functions. Also available for Windows Vista and Windows XP, the Xirrus Wi-Fi Monitor is a powerful tool for both end users and IT managers to monitor, secure, and troubleshoot their Wi-Fi networks. It provides much greater visibility into the Wi-Fi operation of a user's laptop and the surrounding environment than what is available by default from the operating system. The Xirrus Wi-Fi Monitor widget is available as a free download from the Xirrus website at http://www.xirrus.com/library/wifitools.php and will be posted soon on the Yahoo! Widget Gallery at http://widgets.yahoo.com (search for "Xirrus"). PR: app4mac has released CheckUp 1.1, a major update to the innovative tool that allows you to check the health and monitor the behavior of a Mac computer (even from a remote computer). Built from the ground up with Mac OS X technologies, CheckUp features an amazing user interface. CheckUp is first designed to monitor the usage of CPU, Memory, Disk Drives and Network Adapters. CheckUp works with any Mac with a PowerPC G4, G5 or Intel Processor. app4mac has released CheckUp 1.1, a major update to the innovative tool that allows you to check the health and monitor the behavior of a Mac computer (even from a remote computer). Built from the ground up with Mac OS X technologies, CheckUp features an amazing user interface. CheckUp works with any Mac with a PowerPC G4, G5 or Intel Processor. System requirements: CheckUp Requires Mac OS X 10.4 Tiger or Mac OS X 10.5 Leopard, a PowerPC G4, G5 or any Intel processors (Universal Binary). A user license of CheckUp costs $49 USD and can be installed on two computers. Discounts are available for education and volume licensing. A trial version of CheckUp is available.